Digital noise appears as a 'grainy look' on video clips. Shooting in low light with a slow (high F-number) lens and at high ISO will often produce clips with a grainy appearance. Photon Pro uses a sophisticated algorithm to remove sensor readout noise and photon shot noise from digital movie recordings. Eliminate the ugly 'film grain' and make your clips look great! Inspired by the leading photographic editing applications, Photon Pro allows you to do interactive editing with ease and speed. The plug in enables you to set different level of correction for the luminance and the chrominance channels. Both spatial and temporal denoising are supported, as well as mixed-mode spatial and temporal. 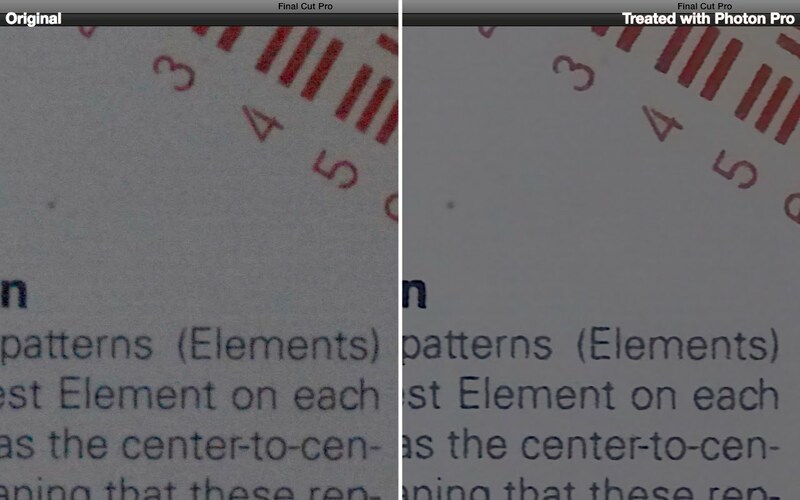 Photon Pro has been designed to preserve edge sharpness while removing noise. The Sharpening filter included in Final Cut can be used downstream of Photon Pro to make the edges look even punchier. Photon Pro will take full advantage of the new Mac Pro (late 2013) dual GPU architecture. A recent and fast OpenCL 1.2 compatible graphic card is highly recommended to achieve the best performance. Requires Apple Final Cut Pro X 10.1.3 or newer. Final Cut Pro is a trademark of Apple Inc.